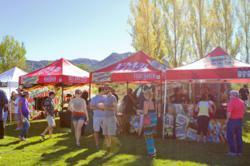 The 2nd Annual Buellton Brew Fest kicks off Santa Ynez Valley’s Craft Beer Week on Saturday, May 11 at River View Park. Tickets are now available for $35 advance purchase and $45 from May 1-May 11, the ticket includes a commemorative tasting glass, lunch, live music from Burning James and The Funky Flames, and unlimited tastings. The Festival sold out in pre-sale last year during its inaugural year. The Buellton Brew Fest’s festivities will feature over 25 breweries breweries, including local Craft Breweries Figueroa Mountain, Firestone, and Tapit; and regional favorites Stone Brewing, Ninkasi, and Trumer Pils showcasing the best in craft beer. Local restaurant Avant will provide lunch to all attendees, with additional food and non-alcoholic beverages available for purchase. The Buellton Brew Fest is the first Craft Beer Festival in the Santa Ynez Valley, and a popular event in an area known for its wine but gaining major attention for Craft Beer. With awards from the Great American Beer Festival on its walls, Firestone Walker Brewing, and Figueroa Mountain Brewing call the Santa Ynez Valley home. Tapit, with its Gold Award for their IPA from the Great American Beer Festival is right up the road in San Luis Obispo; it’s clear that the Central Coast of California is solidifying its place among the top regions for Craft Beer. More information can be found on the web at, http://www.Buelltonbrewfest.com, and tickets can be purchased online at Eventbrite or through the Buellton Chamber of Commerce.